Staff Selection Commission (SSC) has been Conduct a Written Examination of SSC CPO Paper-1. These Exam Conduct on 20th March 2016. Now Latest News SSC CPO Exam Cancel. About these Exam Offical Staff Selection Commission (SSC) Cancel SSC CPO Exam 2016 on 20th March 2016 and SSC also Released an Offical Notification about these. Now These SSC CPO Exam 2016 Reconduct on 5th June 2016. The Staff Selection Commission, in order to maintain the integrity and fairness of the selection process in Various Officer Entry Written Exam. 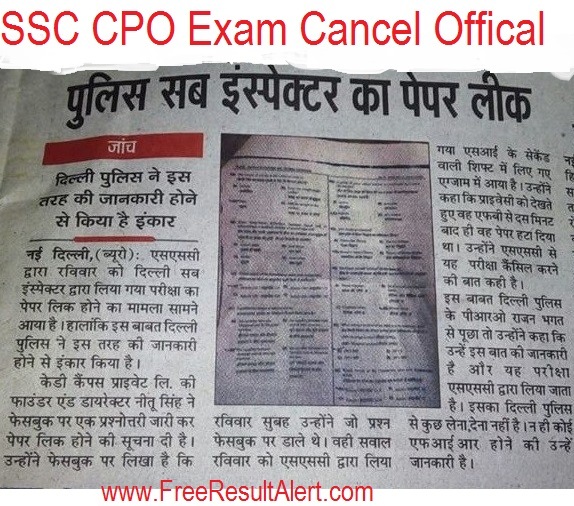 has so-most decided to cancel SSC CPO Exam Cancel 2016 the examination for the Recruitment of Sub-Inspectors in Delhi Police, CAPFs & Asst. Sub-Inspectors in CISF Examination, 2016 held on 20th March 2016 because one paper of the afternoon session was found to have been compromised. The re-examination for only those candidates who had appeared in the examination in the forenoon and afternoon shifts on 20th March 2016 will now be held on 5th June 2016. SSC GD Medical Exam Date and Process For Male & Female Candidate. RRB NTPC Exam Syllabus 2016 for ASM, CA, ECRC, GG, JAA, TA, STK. Candidates if you want to receive any Latest updates Related SSC CPO Exam 2016. You can join us on facebook or Google Plus.